Is this a recipe? Probably not. What this is is taking stock of your pantry and fridge, and figuring what you have on hand to make a meal. Which is basically what happens chez nous, on the reg. fresh herbs: basil, parsley, etc. Bring apple cider, vinegar, bay leaves and a pinch of salt to a boil. Add farro, reduce heat, and cook according to directions, about 10-12 minutes (you may need to pour off a bit of excess liquid). Meanwhile, cut up your mozzarella and tomatoes, herbs and avocado. 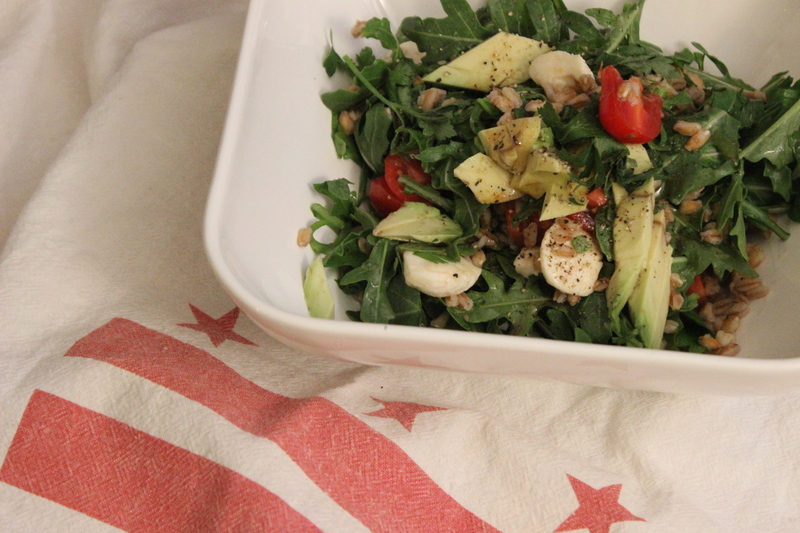 Add to a large bowl and give it a toss with the arugula. Pour the hot farro over the salad mixture and give it a thorough mix – you want the farro to wilt the arugula a little bit. Season with salt & pepper and serve with dressing, if you please. This is worth sharing for one small reason: cooking the farro in the apple cider vinegar and the bay leaves gives it a tart, wonderful flavor that only gets better the longer the salad sits. If you make enough to last you into lunch the next day, you don’t need any dressing. How’s that for healthy! ?.